In a modest West Oakland neighborhood on Market Street is the modest West Grand Shopping Center. Its ordinary building is clad in rough stone, an exterior treatment similar to the Kaiser Building and many other examples. But at the West Grand Shopping Center, the cladding consists of fist-sized pieces of beautiful serpentine rock. The front side of the building is pristine. 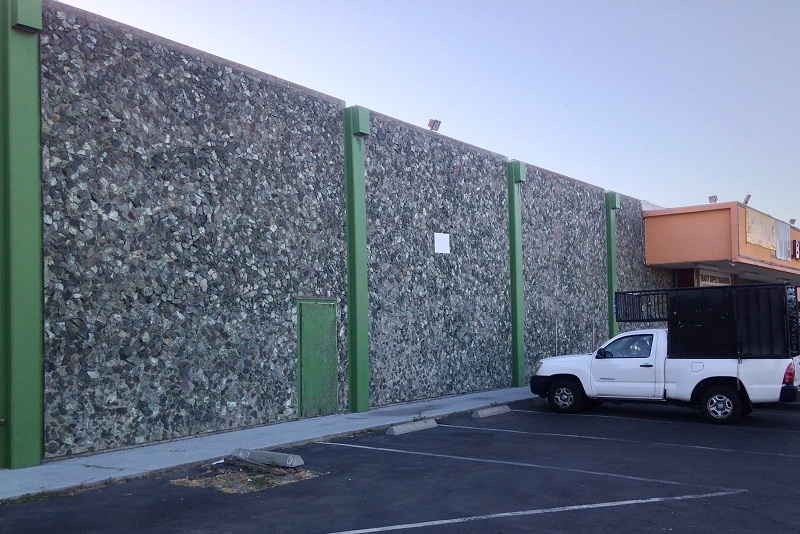 The rear side, on Myrtle Street, is a full block long and completely faced with serpentinite. Unfortunately the bottom seven feet or so has been painted over. 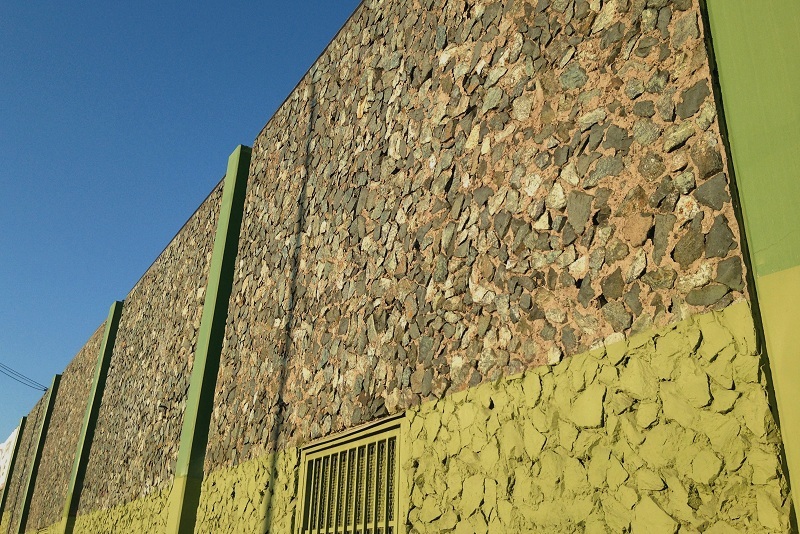 The mutable color of this stone, blue-green in the shade and olive-green in the sun, gives the building a real Oakland look. I don’t know where the stone came from. 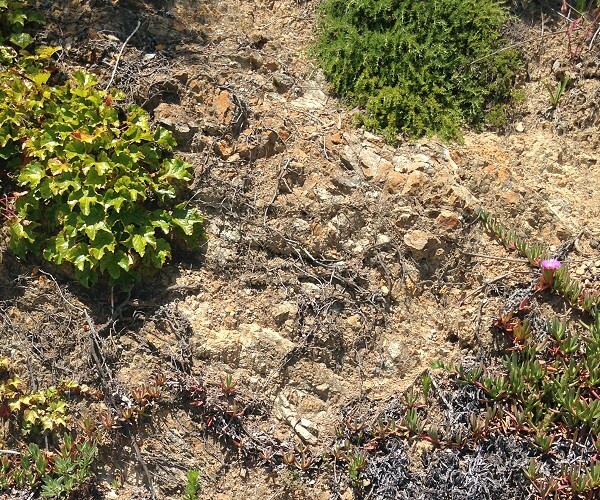 Our own serpentinite is usually bluish and not of this quality, except maybe in small outcrops in the Franciscan melange. Perhaps it’s from a quarry in the Mother Lode country. It must have taken a few carloads of rock and a crew of skilled artisans to put this together. A few months back, when I was presenting the building stone verd antique, serpentinite’s dressed-up cousin, I said “You can’t do much with California serpentine except admire it.” Makes me happy to be proved partly wrong — you can always admire it, and sometimes build with it. 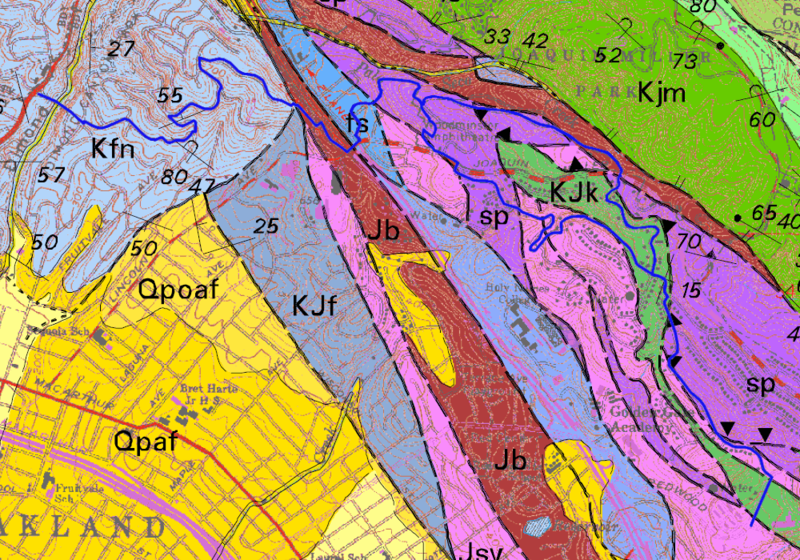 The geologic map of the northern East Bay that I rely on has a few rock units that are very small and hard to notice. 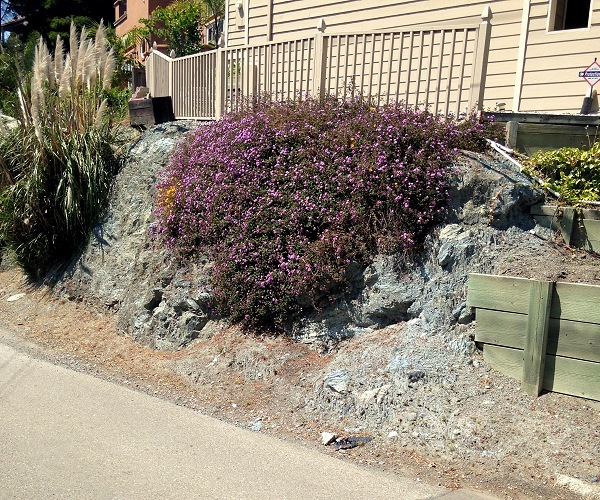 One of them is the ultra-purple unit designated “silica-carbonate rock.” The map shows only three small exposures — one in Oakland and two in Berkeley — but they’re close enough to each other to visit in an afternoon. 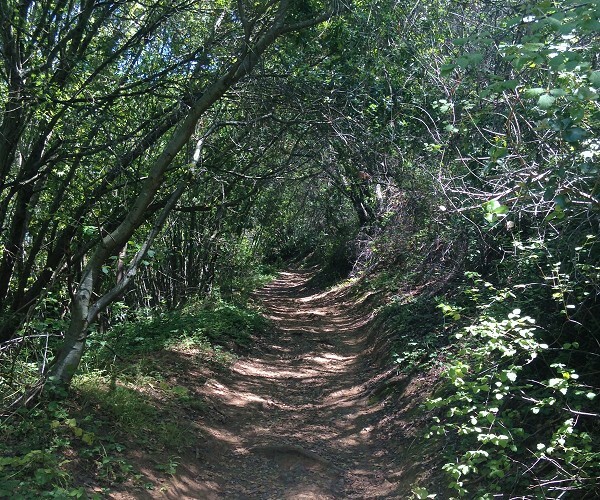 So that’s what I did back in August, hiking from the lower-right corner to the upper-left through all three areas. 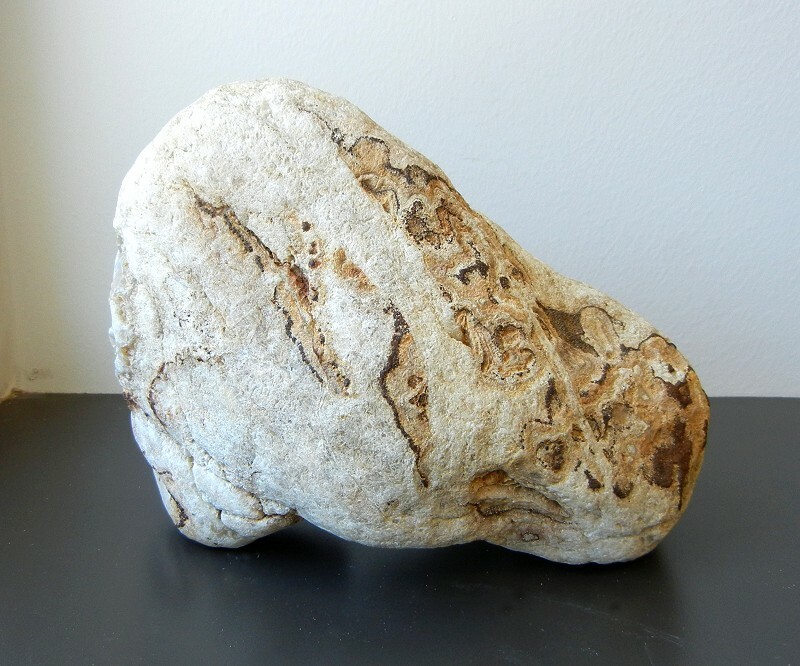 “Silica-carbonate rock” is what happens when serpentine rock is invaded by superhot carbonated fluids, which replace the serpentine minerals with quartz and magnesium carbonates (dolomite and magnesite). 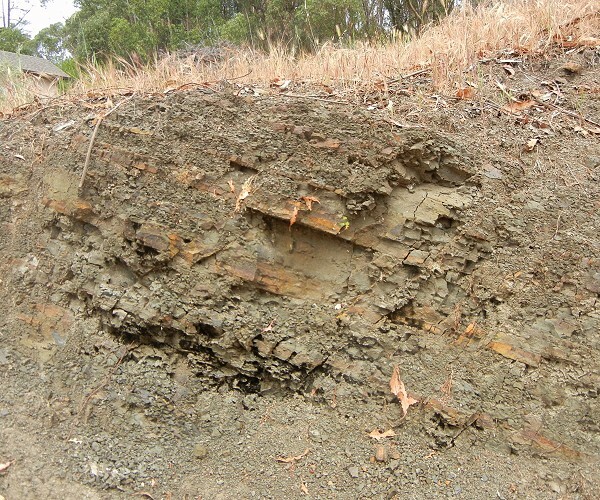 The spectacular mercury deposits of the New Almaden and McLaughlin mines are of this type. I wasn’t too sure what to look for, except that a rock made of hydrothermal quartz and Mg carbonates would be white and messy. 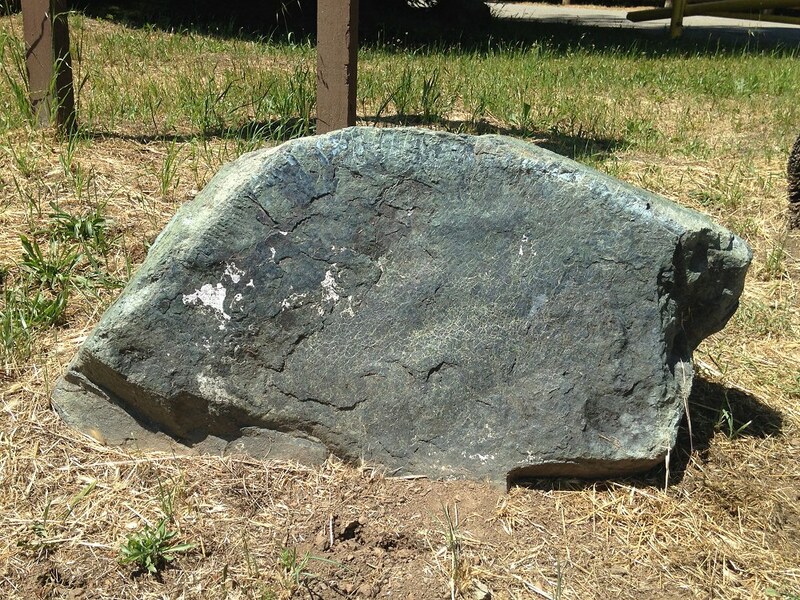 Fortunately, the U.S. Geological Survey library, in Menlo Park, has a boulder-size specimen of mercury ore sitting around. Unfortunately, that’s not a very informative specimen; moreover it’s labeled “calc-silicate rock,” which would be quite different (it’s what happens when lime rocks are invaded by silica-rich fluids). So who knows. 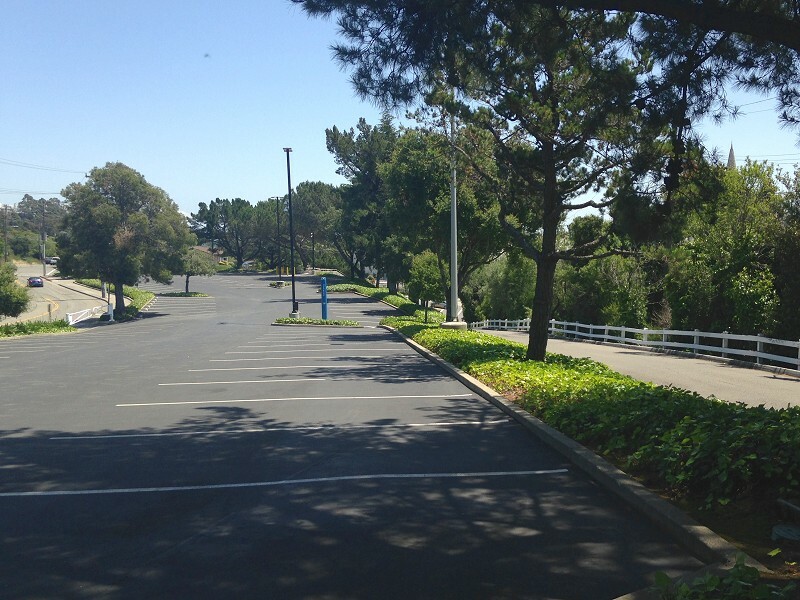 To traverse the first locality, I started at the end of Chabot Road. 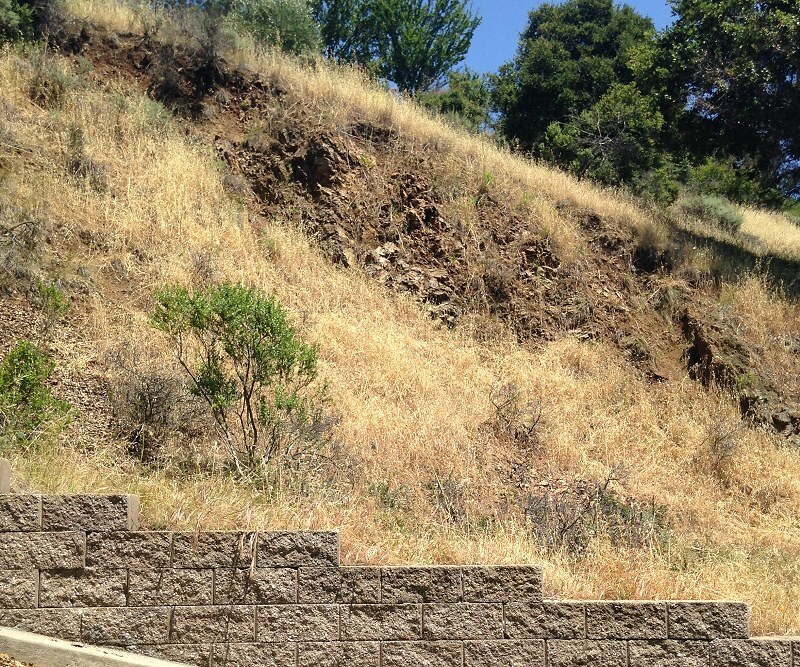 It’s a highly disturbed place where railroads, streets, culverts and freeways have come through over the years, and it’s hard upon the Hayward fault. There is little promise of bedrock here, but I kept a close eye out anyway. There was some float, or loose rock, that was likely local: some brecciated stuff from the Leona “rhyolite,” tumbled down from its exposures above Tunnel Road. Some more of the “rhyolite” plus gray sandstone from the Franciscan melange mapped to the west. 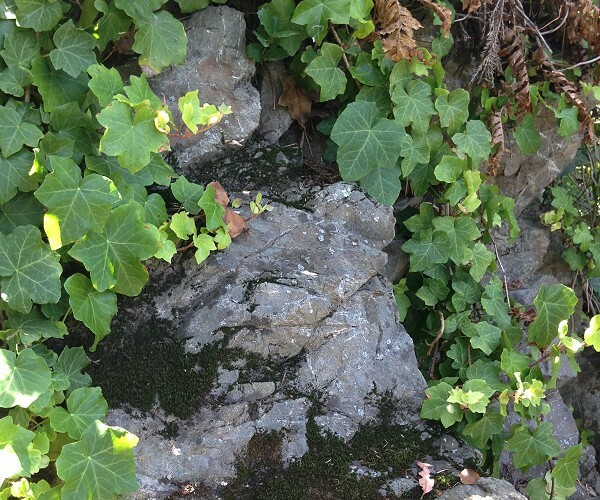 And at the north end, during a strenuous climb, some Franciscan chert from the melange. 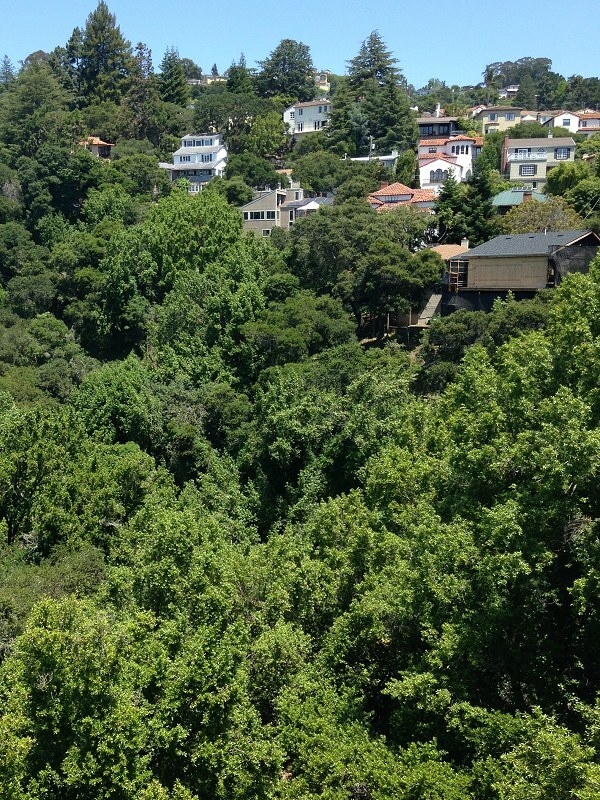 The next locality is at the top of the UC Berkeley campus. That was hopeless, given all the buildings and landscaping. Except for Founders Rock. This excellent knocker has a plaque on the back that reads, “Founders Rock / College of California / April 16, 1860 / Inscribed May 9, 1896” but there are no geological notes. Close up, the rock is enigmatic. Not much to do here but scratch your head, and feel sorry for any geology students assigned to write a report on this rock. 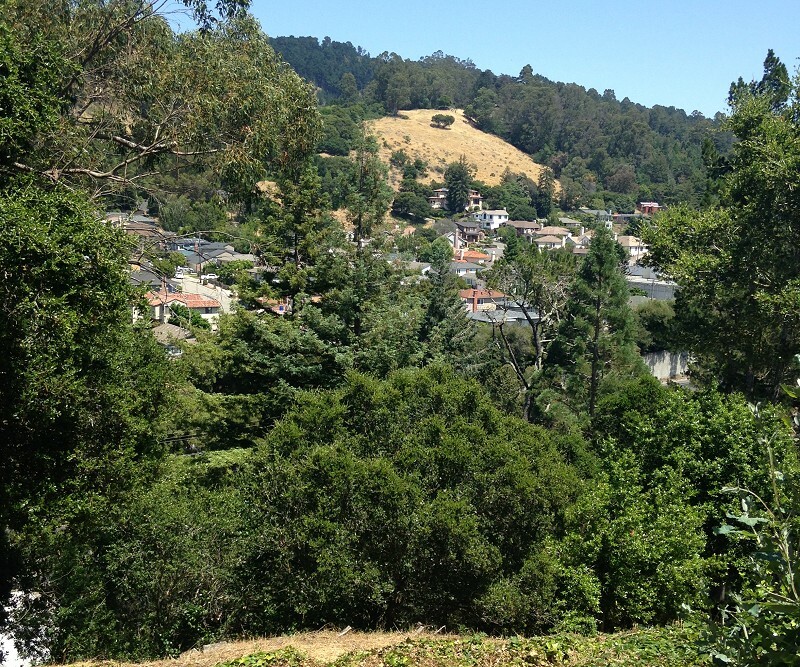 Onward through Berkeley’s steep hills to Keith Street, the third locality. That’s a residential street with all of its bedrock hidden, but I scrutinized the stone walls, in case the builders had used local rocks. You never know. 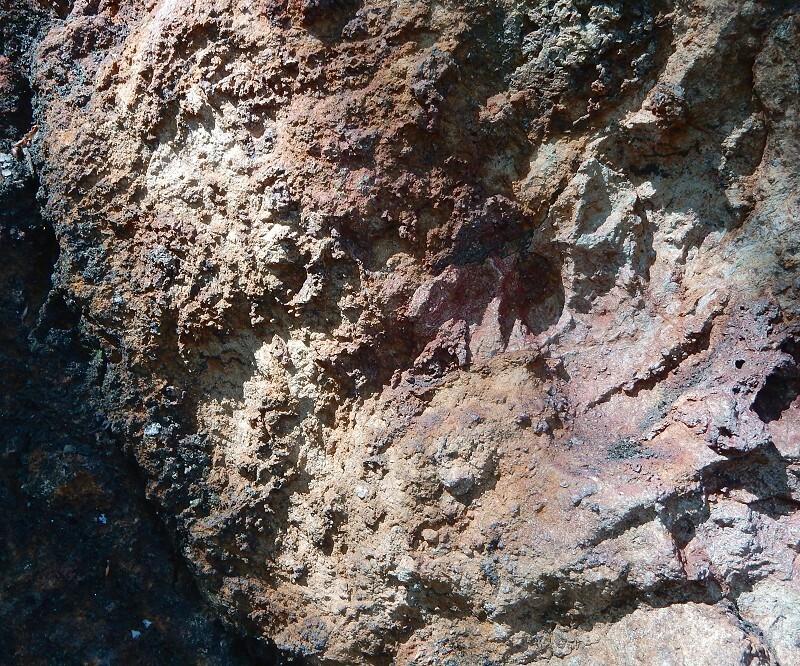 What I see in these is a uniform light color, suggesting pervasive alteration to siliceous material; brecciation and deformation, typical of an active hydrothermal environment; hints of channels and fractures such as you’d expect from hydrothermal replacement; and bits of iron staining from weathering sulfides. 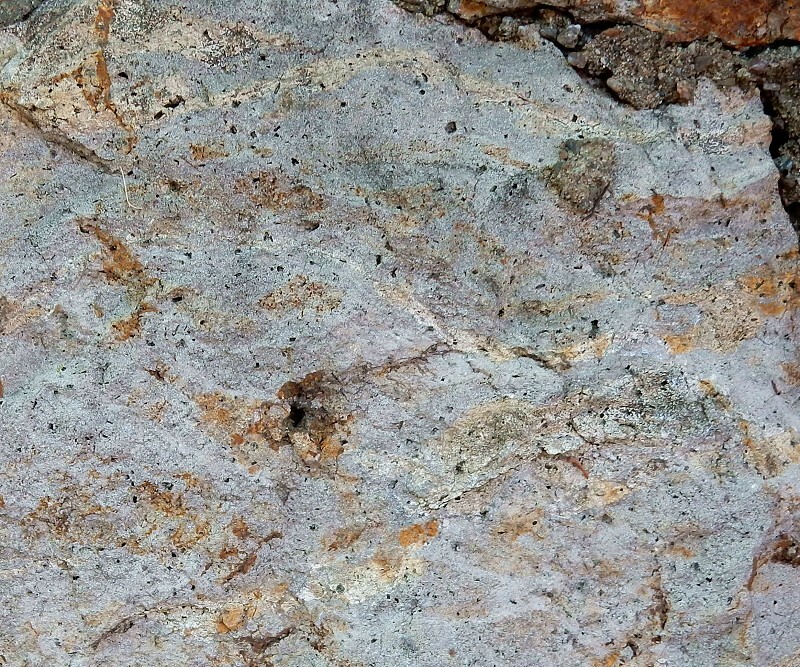 Without chemical tests and petrographic thin sections to examine, none of that is definitive. I did drop acid on them, but there was no reaction, nor would you expect one. That’s OK, I still had fun. 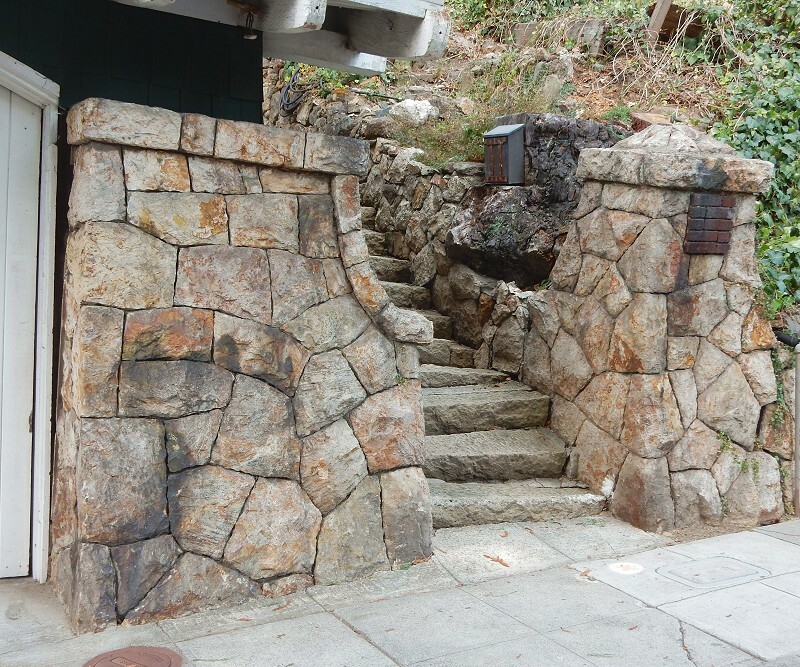 And North Berkeley neighborhoods are famous for their integration of stone with stylish dwellings of all vintages. 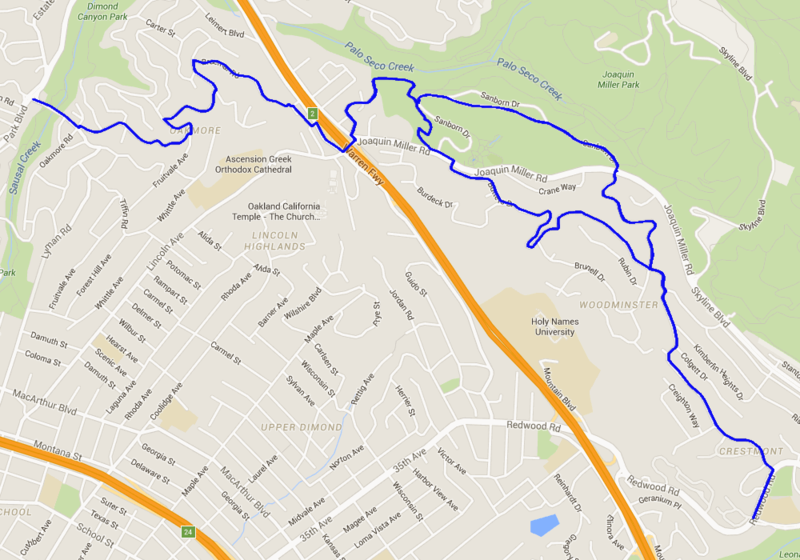 Because it was a one-way walk, from the Rockridge BART station to the 67 bus line, this qualifies as a ramble. 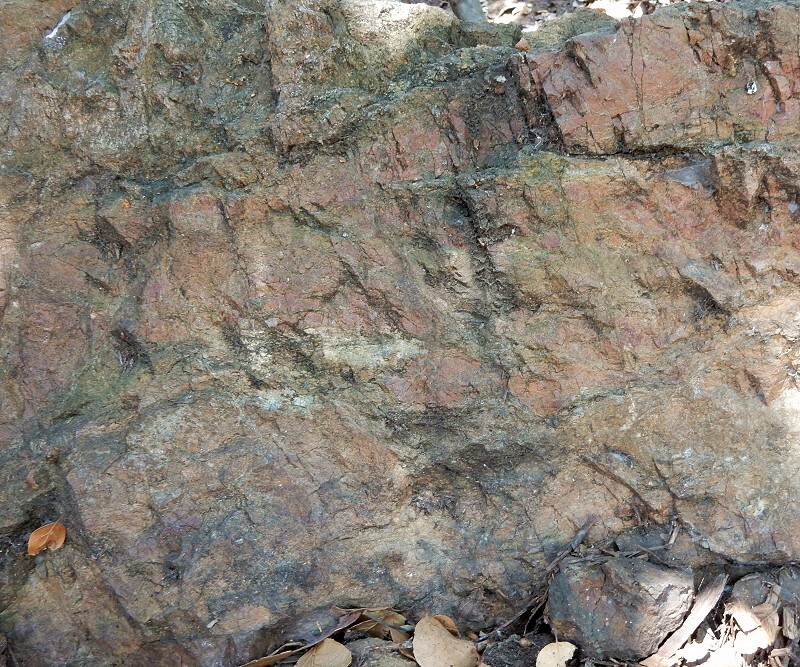 Serpentine rock starts out as peridotite (“per-RID-a-tight”), a very important rock type that is rarely seen because it composes most of the Earth’s mantle, beneath the crust. 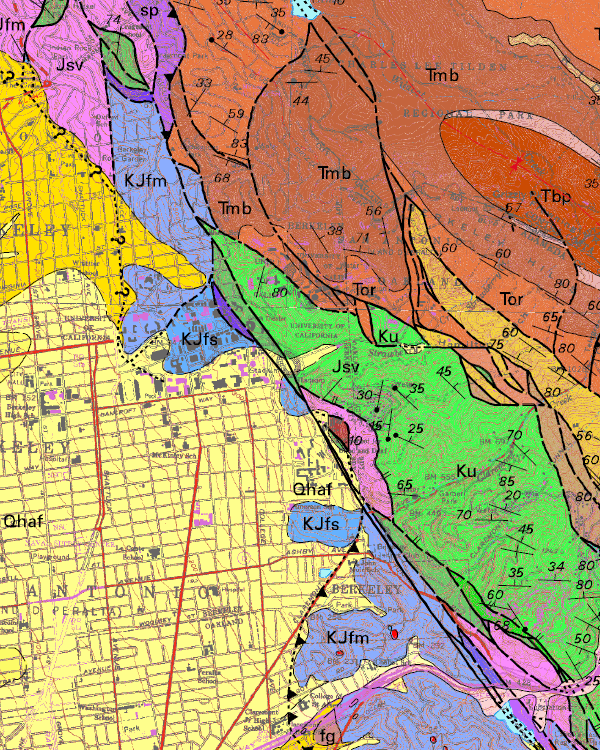 Bear with me as I take you through the outskirts of plate-tectonic petrology. The Earth’s mantle is hot and under pressure — so hot and under so much pressure that if you ease up on the pressure, even a little bit, it starts to melt. That’s what happens in places where the crust is spreading apart. 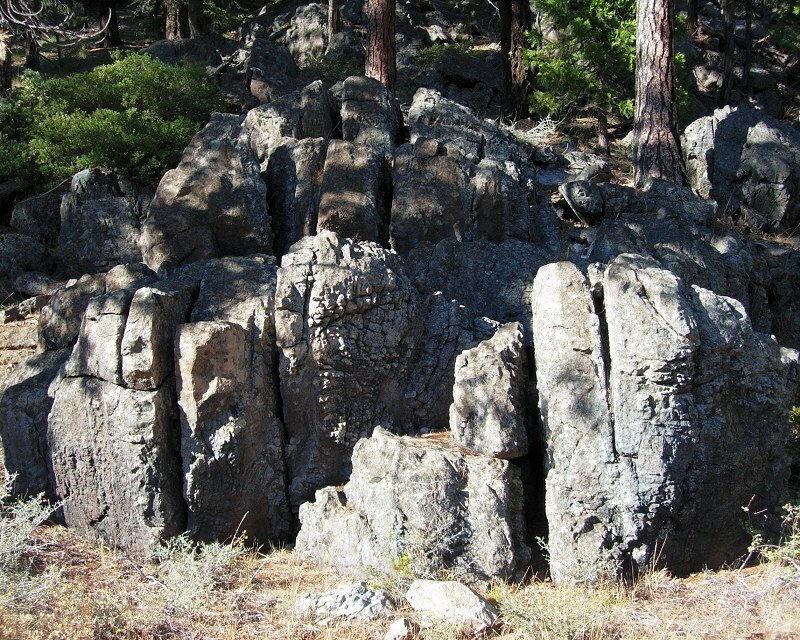 Just a fraction of the mantle rock melts, only a few percent, and the melt — magma — leaks upward, seeking to erupt as lava. Magma isn’t the same composition as the rock it leaves behind. It’s enriched in elements like silicon and aluminum, and depleted in others like magnesium and iron. Silicon is the biggie that governs all of magma chemistry, and geologists track it (like other elements) in terms of its oxide, SiO2 or silica. The mantle is real low in silica, around 40%. The first melt that comes out of the mantle is about 50% silica and hardens into the rock called basalt. The crust of the ocean floor is almost entirely basalt. Beneath it is peridotite, the badass dregs that the magma left behind. The upshot of all this is that peridotite, the dense left-behind dregs rich in magnesium and iron, rides along on the bottom of the ocean crust, and almost all of it stays deep in the Earth. 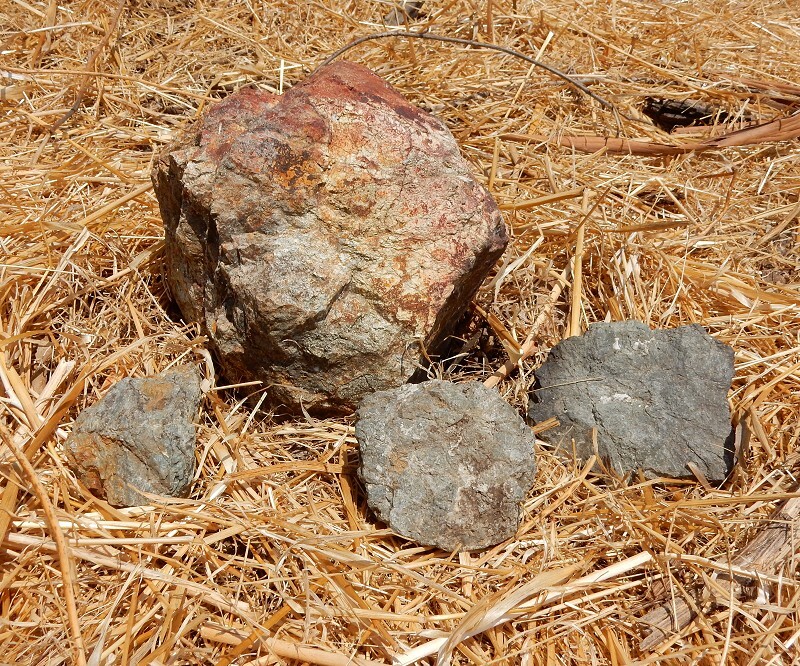 Occasionally chunks of ocean crust end up on land, where they’re called ophiolites (“OH-fee-alights”). 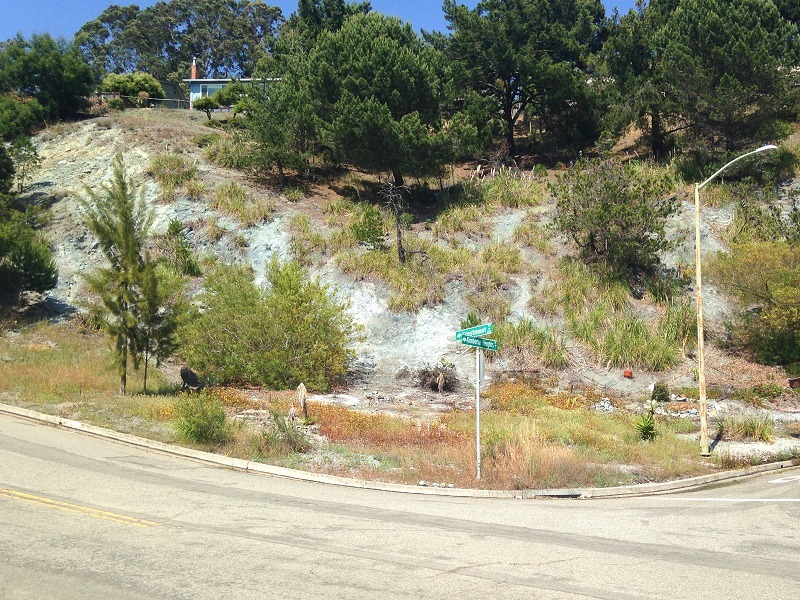 Oakland contains bits of the well-known Coast Range ophiolite. Peridotite, badass as it is, is helpless against superheated water, which reacts with its minerals (olivine and pyroxene) to form a hydrated mineral, serpentine. 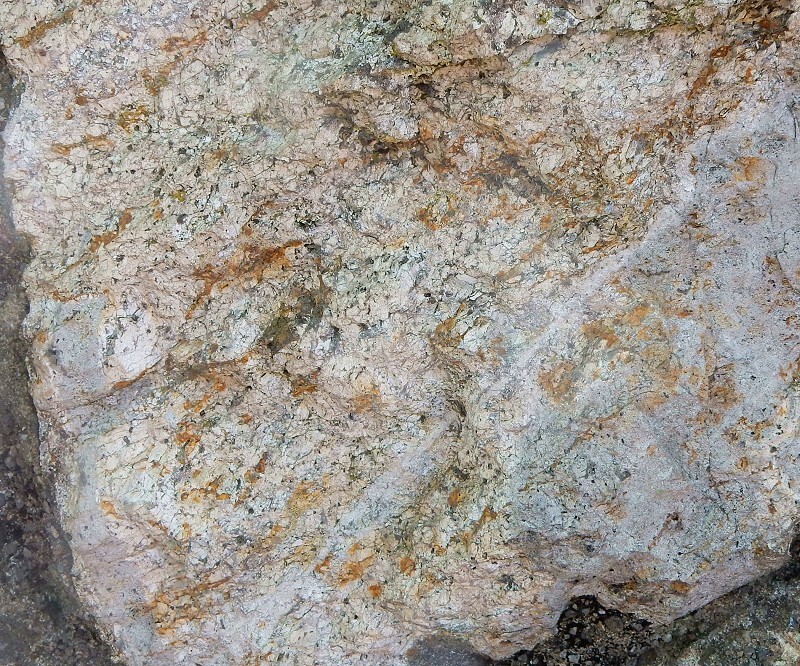 Let me show you what happens in these photos from the Klamath Mountains, America’s largest exposure of peridotite. This is a split-open boulder sitting in a roadside turnout up there. 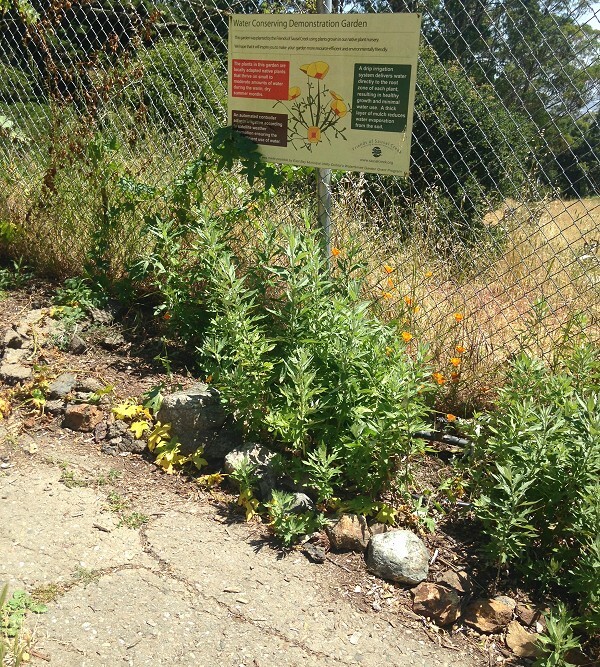 You can see similar examples up at the Serpentine Prairie preserve, off Skyline Boulevard. 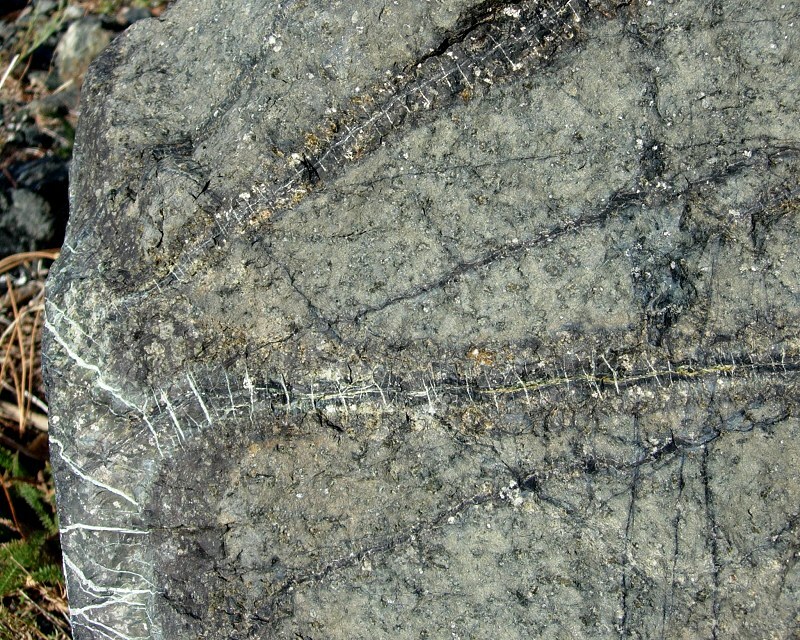 When all of this rock was still a few miles underground, superheated water entered the gray-green peridotite along cracks, and the alteration spread outward from the cracks. 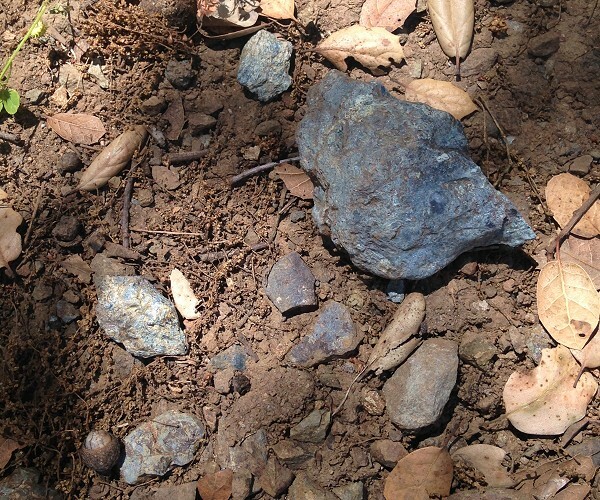 Serpentine takes up more space than the unaltered minerals, so the outcome is just like driving wedges into the rock. Serpentine is also softer. 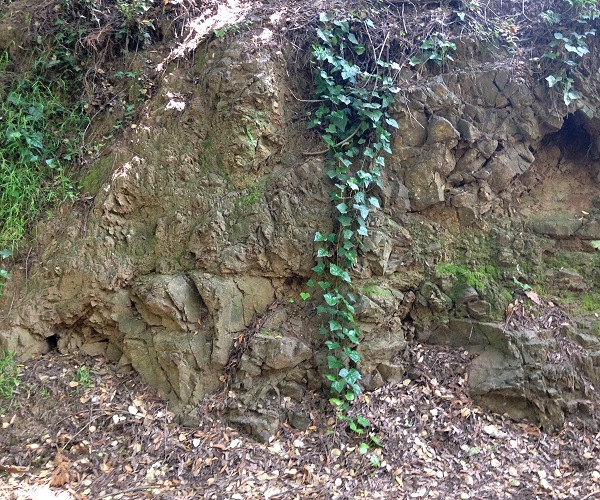 That’s how this peridotite outcrop ended up looking like it does — alteration, then erosion. 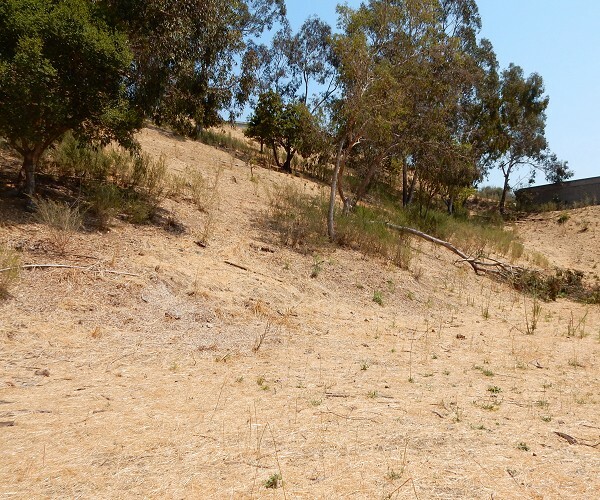 This stage of alteration is preserved because conditions cooled off before the serpentinization process could finish. Usually, peridotite is completely altered. 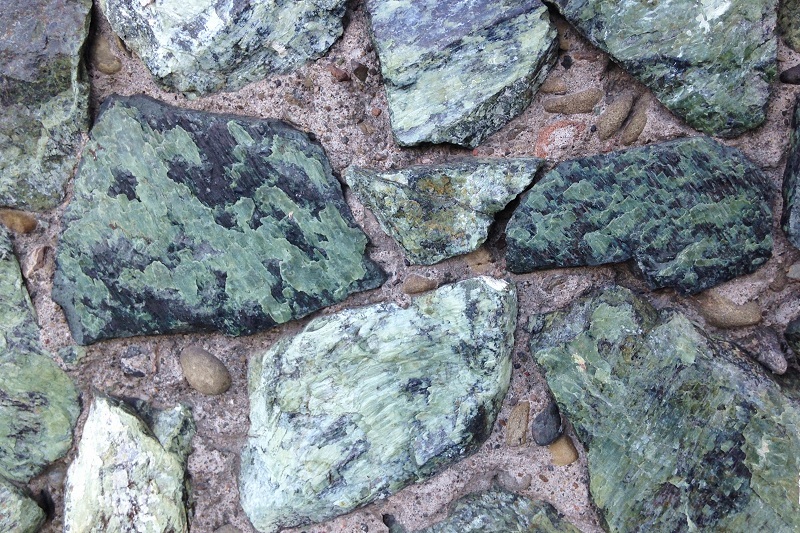 After that, serpentinite tends to slip and slide and flow, erasing any hints of its original structure. 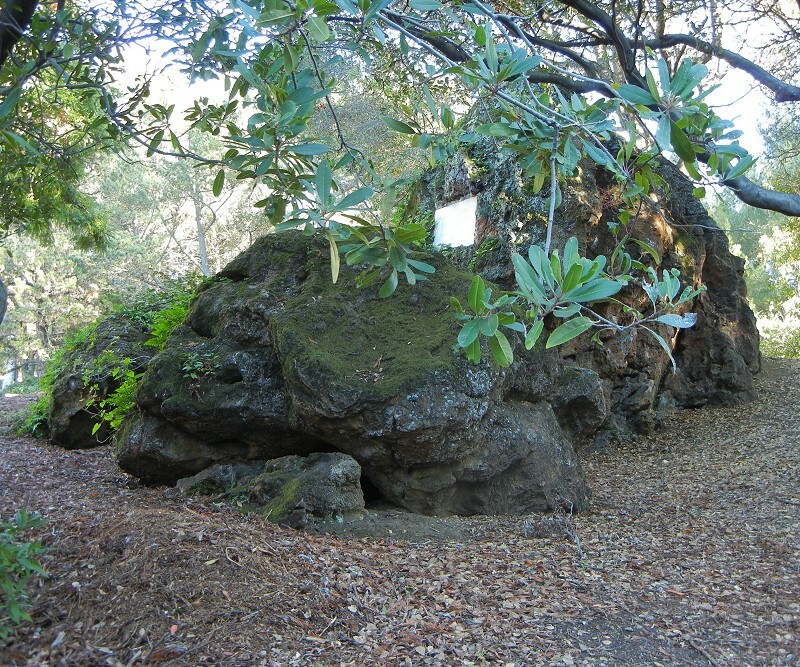 Look again at the big boulder at Joaquin Miller Park. 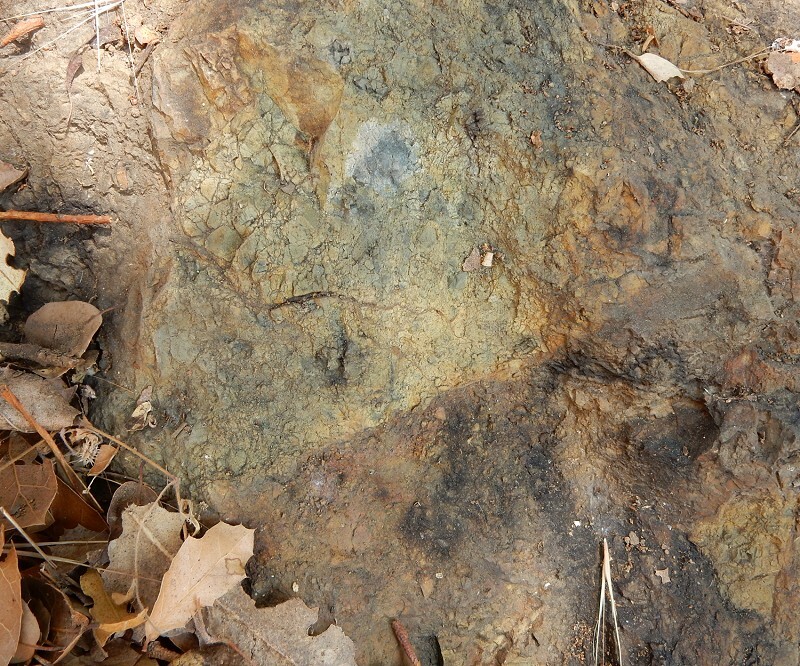 It shows those same spikes on its upper rim, plus a spiderweb of alteration cracks in the center. I find it mesmerizing.